I don't care if you are you and I am I. I am not some exotic flower. Whatever coat you have on, I will put it on to warm me... and the shoes however small... I will walk in them to balance our height difference. You don't need to convert for me; I have already converted to you. You see I never had a religion to begin with. I was born naked from all religions but your love. I know that was not the point. I know there is no conversion. There is no coat, no balance, no shoes but the naked truth of me finding you first, not you finding me. You, whom will never know who I was when I was sitting on the white sheets. Y o u, not b e s i d e m e.
And the words that are already written. The words that are already said, are already felt, and are already gone. And I try to take them back into my empty bowl of hands. To put my hands on the chest. The chest into rest. The rest in to the heart. The beat back to the soul. The soul, back to what it was before you. Published in print and online the poem has been presented in many projects including Get Lit classic slams and curriculum for educators. And the uncertainty of the future at fourteen. While I maintain the high standard of punctuality In America, my home away from home. there are broken hearts, broken women. are today nothing but walking hungry houses. they carry their bodies around, in the covered coffin veils. their voices not allowed to come out of their dried mouths. with each sound of shooting and terror. in the tragic endings of their lives. Woman, are you the brown March Violets? until I freed her out”. were the poisoned houses of wishes! The poem was written and first published during the Taliban’s rule. It has since been anthologized and translated into several languages, and taught in colleges and high school classrooms around the world, including India, Japan, Croatia and UK. Artists have incorporated this poem in their work. 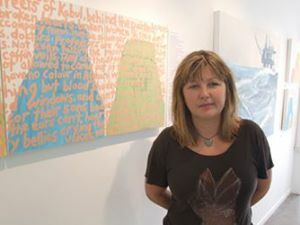 Picture shows artist Lucy Bucknall next to her painting with the poem written on it. an unwritten law in a lawless land. chipped beliefs and spreading tears. of power and announces another castration. we still cry over the Arab-Israeli War. In 2012, LGen the Hon. Roméo Dallaire, Senator from Quebec, Canada, closed his speech on the situation in Iran with sections from this poem. A winner of Harvest International, the poem has also been anthologized and published amongst others in The Forbidden: Poems from Iran and its Exiles, The Atlanta Review, IRAN issue, and Iranian and Diasporic Literature in the 21st Century: A Critical Study by Dr. Daniel Grassian. And cockroaches that flew on four wings! in the pockets of my ears. This poem was set to music as an artsong for mezzo-soprano and piano and performed at Old Dominion University﻿, Virgina, U.S.A.